The Dangers of Polyunsaturated Fats - Coconut Oil Works: An easier way to use the worlds #1 most beautifying ingredient for skin and hair. Polyunsaturated fats are hiding all over our daily diets. Fats are actually an important part of our diet because they help to build cells in your body, provide energy and can be converted by our body to help create and maintain important chemicals such as hormones. But there are several different kinds of fats, and some provide the healthy benefits we need, while others actually pose a danger. Some polyunsaturated fats have been shown to cause health dangers. In order to understand why, we first have to understand what they are. Polyunsaturated fats, also known as PUFAs, come in two main types types; Omega-3 and Omega-6. You’ve probably been hearing a lot about Omega-3 acids lately because it has been discovered that this version is good for us in small amounts. You wouldn’t want to go eating a whole barrel of it, but there have been some studies done that show the importance of Omega-3 fatty acids for brain and eye development, possibly helping with Alzheimer’s and dementia. Omega-3 can be found in shellfish, fatty fish, and some types of seeds (like flax seeds). The Omega-6 version occurs naturally in nuts, legumes, seeds, and some animal products. 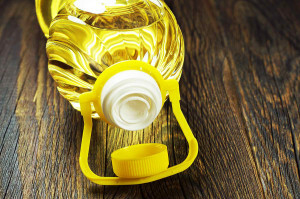 The problem is that we have started to take these fats and turn them into concentrated oils like canola oil, vegetable oil, corn oil, soybean oil, and cottonseed oil. These oils are then used to cook and fry our foods. PUFAs, in technical terms, are considered unstable because they are missing their hydrogen atom. This makes them prone to oxidation, which then leads to health problems. Studies in mice who have been fed oxidized PUFAs show that the mice had increased levels of inflammation. High levels of inflammation can lead to things like heart disease, diabetes and some forms of cancer. When PUFAs are exposed to heat, light and oxygen, they become oxidized. Oxidized means that the chain of fatty acids becomes broken up into an unstable chain. The unstable fats start attacking the cells in our bodies and can cause mutations in your body’s cells and tissues. In order to get vegetable oil, canola oil, soybean oil, or any other factory-processed oil, the process starts in a factory where they expose the seeds to high amounts of heat and pressure (plus chemicals) to get every last bit of oil out. Then they sit on the shelf in clear bottles for weeks and sometimes months. Exposure to light causes further oxidation. So when you purchase these oils from the store, they are arriving to you in an already oxidized state. To sum up, PUFAs are a very unstable form of fatty acids that cause damage to the cells in our bodies. A great alternative to PUFA oils is coconut oil. Coconut oil has a more stable chain of acids and is not as processed as PUFA oils. It can be used at higher heats without oxidizing, and adds a good amount of fatty acids to your diet. Next time you are baking, frying, or sauteing, grab coconut oil instead!